Hey bees, I’m a little bummed at the moment. Fiance and I had chosen the bakery for our cake before we even got engaged, this little bakery his mom has gotten cakes from since he was a kid, which he introduced me to a few years ago and now I love them too. They are seriously insanely delicious, and while they don’t specialize in wedding cakes, their website had a whole section about how they do them and all that so we assumed they did. We want a super simple design- tiered, but just a textured buttercream and nothing fancy decor-wise. Well I called today to ask about scheduling a tasting, and it turns out that they stopped doing wedding cakes 3 years ago (they really need to update their website apparently). They said that sometimes people still order cupcakes or sheet cakes for weddings though, they just don’t do tiers or anything for any events anymore. This is such a bummer to us as we were really looking forward to the delicious cake, but also imagined something tiered and wedding-looking even in it’s simplicity. So now our options are to find another bakery, which our concern is we’ll be overpaying at a specialized “wedding cake” bakery, and that the quality might not be as delicious because they may be more about design and decorations, you know? Or to consider getting a sheetcake from our preferred bakery, but we would be missing out on a pretty cake and getting to use our topper, and we’re a little concerned about it looking cheap/informal (not that we’re going for a very glamorous vibe or anything anyways, but I’m worried it might take the tone into a more casual direction when our venue already has the potential to go either way, if that makes sense). Has anyone here had a sheetcake for their wedding or been to one that had one? Any pics or input would be appreciated! I know this is a relatively trivial thing, but it’s been a week of minor bummers like this so I’m just trying to find the best solution for this one! Thanks bees! I’m super picky about cake, hate fondant, artificial flavor/color, and other things you find in traditional wedding cakes. The best bakery in our wedding location didn’t do tiered cakes. I decided I cared more about taste than I did looks, and went for a pretty cake table. We picked out 4 different flavors, and they made different round cakes and laid them out. There was a gorgeous fruit topped one, a dense chocolate one, etc. People came up all night and said it was the best wedding cake they had ever had. You could easily have them do a variety of single layer cakes, and make them look fancy on a table using cake stands and decorations. That way you still get the nice connection to the bakery, and some very tasty cakes. Why not have them do a small round cake decorated to your preference for cake cutting then have their sheet cake in the kitchen to be cut for guests? or… do a small bridal cake elsewhere and have a sheet cake of theirs for the grooms cake. or have a fake foam cake made for pictures… you can do a real top tier for cutting then have their sheet cake in the kitchen for serving. bayoubee : This is a great idea. I am a big believer in having a better tasting cake than a mediocre cake that looks prettier. I think most people agree. 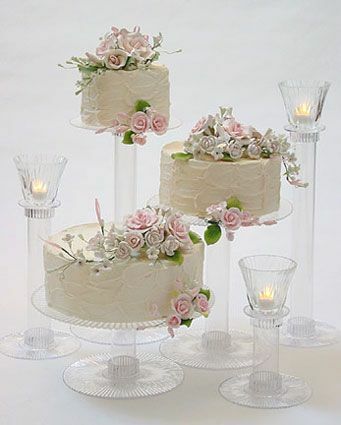 Many, many coupes have a small cake on a pedestal cake stand for cutting, and use sheet cake with the same frosting and look, to serve the guests. I would do a small cake on a pedestal for cutting, surrounded by cupcakes. Or a tiered arrangement of cupcakes. Or optionally, just order individual rounds (or whatever shape you’d want your tiers) from them and stack it yourself. There are tons of videos on how to do this. If they still do cupcakes why not order a variety of flavours and then get a cupcake stand to display them for pictures and then u can either get a really small cake to cut. Maybe you could have them do something like this? I agree that they can do a small round to cut and sheet cakes in the back cut for guests. If you want tiered, ice foam rounds and only the top layer will be real. I also want to say, now I desperately want cake. I really like the idea above with the three cakes on stands. Looks great and easy to transport. Get three different sized sheet cakes. You could do different flavours for each sheet cake tier. It helps that you know and like the bakery. I’m sure you could rent a stand from somewhere, they may even know a place. We used a sheet cake from our local grocery store. It wasn’t very fancy but it tasted great. Wow, thank you all so much! I feel infinitely better now haha, clearly there are a lot of awesome options! I really really appreciate all of your suggestions and input, thank you so much! 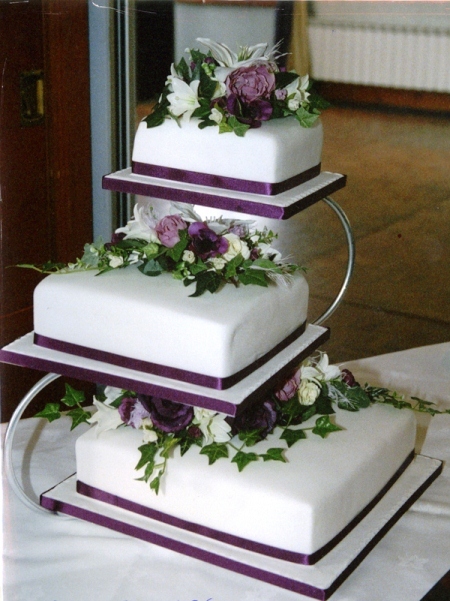 aoifeo : steny03 : I think I am going to try the idea you both suggested first and have a pretty cake table with a few different single layer cakes. I love that idea, and I definitely agree that taste is most important! Thank you!